In the meantime, there will be plenty of discussion about every series. Who will win? How competitive will they be? What are the key matchups to watch for? All of those are great questions, and will be discussed at length, but for now, let’s rank each series in terms of excitement and watchability — starting from the least interesting to the most. No thank you. This series is going to stink. The Bucks were always going to cruise through the first round no matter who they played, but the Pistons are a mess. They limped into the playoffs winning just two of their final six games, and Blake Griffin’s status for Game 1 is still in doubt. You don’t always want to read too much into the regular season series between two teams, but the Bucks won all four games against the Pistons this season by an average of 15 points. There were a lot of ups and downs for the Warriors during the regular season, but once again they emerged at the top of the Western Conference standings, clinching the No. 1 seed for the fourth time in five seasons. Their reward is a first-round matchup with the Clippers, who were a tremendous story this season, but simply don’t have the talent to match-up with the Warriors. To be fair, no one really does come playoff time, but the Clippers especially are in for a tough time. The Clips know who they are, and play really hard, but while that might work in the regular season, it’s not enough when Steph Curry and Co. turn things up to playoff intensity. We know exactly what’s going to happen here, and we’ve seen it countless times over the years. The Magic are playing some of the best basketball in the league right now, closing the season on an 11-2 run to win the Southeast Division and clinch their first playoff berth since 2012. They were fantastic defensively after the All-Star break, boasting the fifth-best defense in the league, and have the type of streaky scorers in Terrence Ross and Evan Fournier who have the potential make things interesting for a few games. But in the end, it’s hard to see what advantages Orlando has in this series. Toronto is just better all around the floor and has a top-five talent in Kawhi Leonard. A few of these games might be competitive, but even with their shaky postseason history, the Raptors should handle their business pretty quickly here. The biggest question heading into this series is the health of Joel Embiid after GM Elton Brand told reporters it was “possible” the star big man isn’t ready for Game 1. Even without him, the Sixers still have way more talent than the Nets, but few players have as big of an impact on their team as Embiid, who sports a plus-11.3 net rating differential. If he’s not ready to go, this series could get pretty interesting. D’Angelo Russell has played like a certified All-Star this season, and the Nets are healthy with Spencer Dinwiddie and Caris LeVert back in the lineup. This has all the makings of a classic series where the Sixers still win in four or five games, but get pushed in all of them. This is easily the most interesting matchup of the first round series in the East — especially after the Celtics learned they would be without their defensive mastermind and leader, Marcus Smart. On paper, the Celtics should be able to handle a Victor Oladipo-less Pacers team without too many problems. But on paper, the Celtics shouldn’t be the No. 4 seed in the East. If they can flip the switch, and Gordon Hayward keeps up the strong play he’s been giving them over the last few weeks, Boston could make this series pretty short. However, the Celtics have been inconsistent all season long, and the Pacers are exactly the type of solid, hardworking team that can take advantage of lackadaisical play. This is another nice first-round matchup, and features two teams who took similar paths this season. Both struggled early, figured things out towards the middle of the season, then took off after the All-Star break. Since that point, the Rockets and Jazz have the two best net-ratings in the entire league. Plus, there’s plenty of familiarities here in a rematch of last season’s second-round showdown. Between James Harden and Chris Paul, the Rockets have more high-level talent, and usually that wins out in a playoff series. The main question for the Jazz, is who steps up outside of Donovan Mitchell? The second-year guard has been tremendous in the second half of the season and played well when these two teams met in the playoffs last time. But they’ll need someone else to step up, otherwise, they’ll likely be knocked out by the Rockets yet again. This is a fascinating matchup, with all sorts of storylines. The Nuggets are a young, mostly unheralded team who may have overachieved a bit in the regular season, and are making their first trip to the playoffs since 2013. On the other side, the Spurs lost franchise stalwarts Kawhi Leonard, Danny Green, Tony Parker and Manu Ginobili in the offseason, but because of their culture, and the leadership of Gregg Popovich, regrouped to extend their playoffs streak to 22 seasons. Aside from fringe MVP candidate Nikola Jokic, who steps up for the Nuggets in what will be the first playoff series for most of their rotation? Will the Spurs’ veteran leaders, LaMarcus Aldridge and DeMar DeRozan be too steady and experienced for the young Nuggets? There are all sorts of ways this series could go, and it might just take seven games to decide it. 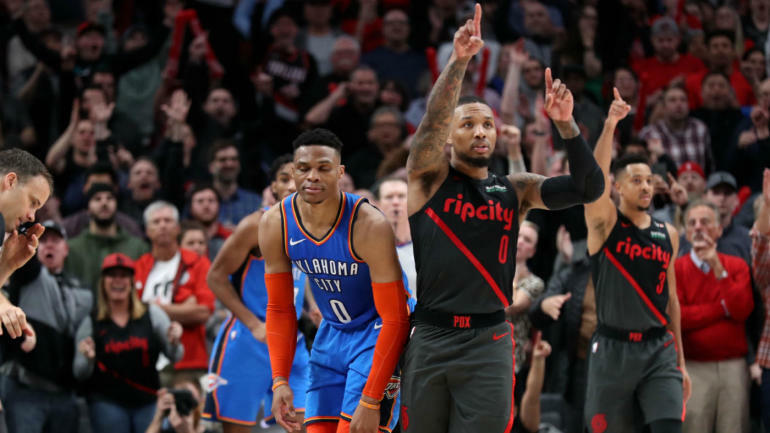 It sure seemed like the Trail Blazers were trying to lose on Wednesday night in their regular season finale so they could avoid facing the Thunder in the first round, but they didn’t get their wish. Now, despite being the higher seed, Portland will have to take on an OKC team that beat them all four times in the regular season and will do so without their starting center, Jusuf Nurkic. That doesn’t mean this is going to be a walk in the park for the Thunder though; they haven’t exactly been the most consistent team down the stretch. Yes, they closed the season on a five-game winning streak, but they had lost seven of nine games just before that, and there are serious questions about the health of Paul George’s shoulder. This series feels like the toughest one to call in the first round, and hopefully, the games will reflect that. There’s going to be a ton of talent on the floor, and each team will have plenty of motivation after being bounced in the first round last season.